QUIJINGUE, BRAZIL. PALLASITE. Found 1964, Identified in 1998. The Quijingue, Brazil meteorite is a fine example of the Pallasite class of meteorites. It is characterized by having large golden yellow green rounded olivine crystals encased in an silver iron-nickel matrix. Of all the known meteorites, pallasites are the most beautiful, and yet the least understood. Because of the nature of olivine, these meteorites do not yield their secrets to scientists easily, and though they are the objects of intense study, and theories as to their origins abound, the cosmic code that they contain has not yet been cracked. 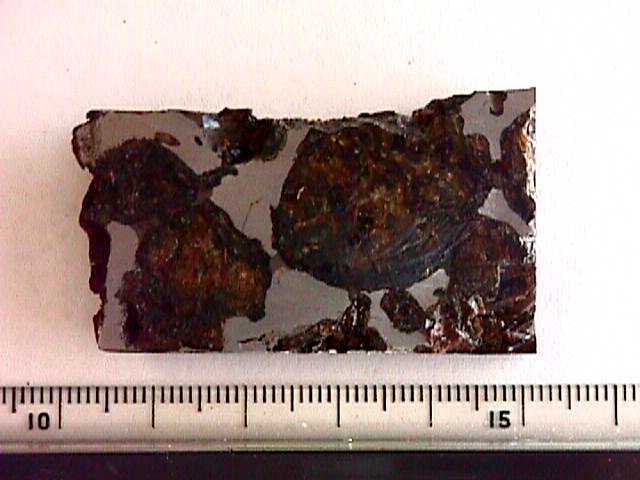 A 58 gram cut block of the Quijingue Meteorite. The overall ratio of the mineral olivine to that of iron is 70% olivine to 30% iron.